Matthew Agostinis is a furniture designer/maker who has recently graduated from Sheridan College’s Furniture Design program in Oakville, Ontario. During his three years spent as a student many talents were developed such as woodworking, welding, photography, drafting, drawing, and concept development. The time spent studying the work of modernist designers, faculty members, alumni, and fellow students has given Matthew a sense of direction with his own work which embodies a style of cantilevering, simplicity, and weightlessness on a functional level. The idea of suspending or elevating a heavy looking object in a very delicate manner is intriguing to him. This is achieved by using the most minimal parts possible to create a rather simple style. Matthew’s experimentation with new forms and materials allows him the freedom to create unique furniture based on his visions, which he follows through from beginning to end. Understanding the rigid ness found in bent laminations has allowed Matthew to take advantage of simplicity by generating forms, which appear thin and potentially vulnerable. Always applying to contests and awards has generated excellent responses for Matthew’s work and has lead him to enter such commissions as the Mayor’s Awards for business and the arts. This corporate commission has lead to publications in local newspapers and excellent media coverage. 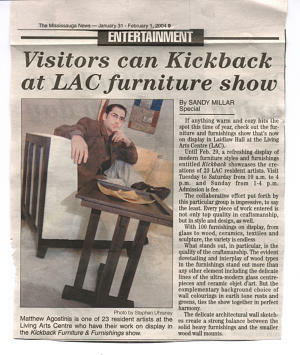 Selected pieces of Matthew’s furniture have been displayed and sold at such galleries as the Wagner-Rosenbaum, One of a Kind show, Interior Design Show, Living Arts Centre and breakfast television. Past projects included the development and construction of prototypes for Harvest House Furniture located in Toronto, Ontario. This project involved the study and development of furniture, which can adapt easily to small spaces such as drop leaf tables. Others included the addition of living room pieces that match their popular Madison Collection. Current projects include custom furniture and installations for residential and commercial clients in the GTA, as well as the completion of his artist-designed room for the newly renovated Gladstone Hotel. Matthew is also currently a part-time resident artist in the wood studio at the Living Arts Centre located in Mississauga, Ontario. Matthew is always in search of new clients, commissions, work opportunities or collaborations where his ideas can be expressed through the creation of a tangible object.